The panel is pretty solid and beautiful. The installation is also easy, just 16 screws to set up. Good deal, and it wroth to spend $700. ProsThis is my first time buy on Inmod, and this table is awesome The panel is pretty solid and beautiful. The installation is also easy, just 16 screws to set up. Good deal, and it wroth to spend $700. Always apprehensive to order big ticket items online but this company were great to deal with. Once ordered I got an email and call on how to deal with it's arrival. A hauler brought it to my door and he waited while I inspected it. It was easy to put the legs onto the table top and it's gorgeous. Modern with chrome legs yet the walnut calms it down a bit. It's a perfect size and easily wipes down. Highly recommend it. 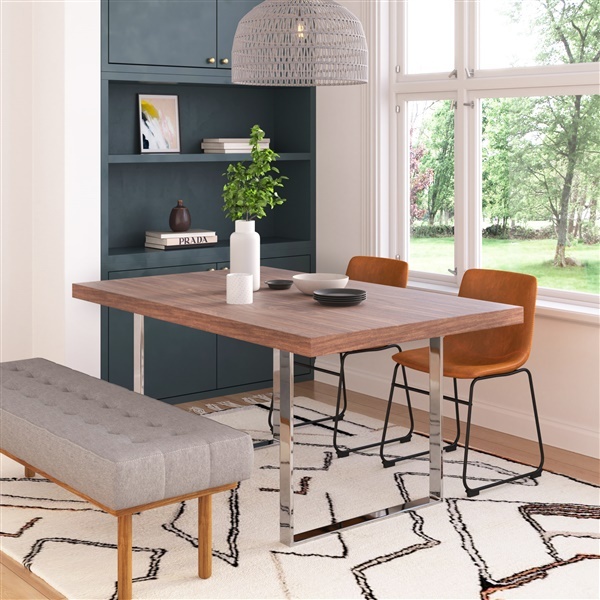 Keep my old table and face having a shabby looking dining room or order something new to transform the place - i opted for the latter and it was a fantastic choice! EXCEPTIONAL! Plenty of room on top and leg room underneath, a beautiful addition to my home! Absolutely LOVE the chrome finish on the legs with the wood top! Gorgeous table!! Beautiful! Sheen on the legs catches sunlight during the day from the windows and it is stunning! Love that the top is wooden or it might be a little too bright! a fabulous combination! always be sure to measure your space! BEAUTIFUL!! I love this site soo much, everything i order from here is always fantastic! Will be coming back soon!!! Gorgeous! Plenty of space, well constructed and looks fabulous in my dining room! awesome table!! I should have went with the larger size but i'm still happy with everything about it! modern minimalism!! Love this table! Durable, strong, well-made! Item just arrived and I am very satisfied! Is the table surface susceptible to water and heat damage? Do I need to use a coaster and trivet at all times? We do recommend using coasters, placemats, and trivets on the dining table while in use. What chairs go well with this table? Is there a recommended seat height? We love to pair this table together with the Molded Plastic Eiffel Side Chairs! Many different styles can be paired together with the table. You may be interested in the Bastille Cafe Stacking Chair and Saarinen Side Chair with Wood Legs. We would recommend a dining chair with a seat height maximum of 18". Does this table scratch easily? is it comparable to wood veneers? The Eco-Natura Roma Dining Table is made of real wood veneer and is protected to be scratch resistant. Hi I would like to know if large size fit set of 6 , thank you !! The large Sized Roma Dining Table will comfortably seat 6 chairs. Is the table top smooth or does it have any groove on it? The table top surface of the Eco-Natura Roma Dining Table is going to be a smooth surface, without any grooves or texture. What is the width clearance between the legs on the long side of the table? (I'm trying to ensure that 2 of my DR chairs will fit easily between the legs on each side.) Thanks! The leg clearance for the large size is 55.75". The leg clearance for the small is 40". How to care for the walnut veneer top? Dust wood veneer with a dry cloth regularly. For cleaning, dampen a clean cloth with water (or a mixture of water and mild soap) and wipe dry. How many seats can be used with the small table? And the Large? The small table seats up to six. The large table can seat from six to eight people.